In an attempt to get themselves out of a mess of their own making, the IUCN Polar Bear Specialist Group (PBSG) has just dug their hole even deeper. …you might conclude, after reading the rest of this post, that polar bear specialists don’t really understand what these terms mean. 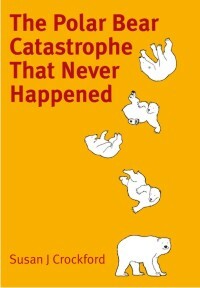 The new clarification, apparently co-authored by Steve Amstrup and Andy Derocher (PBSG 17 minutes, pg. 33 – copied below), makes an astonishingly bold claim that I can easily show is untrue. Shaking my head in amazement, but having other things to do just then, I left it for a few weeks. Looking at it again a few days ago, I saw it had been revised on July 11 (pdf backups: July 8 version; July 11 version). However, what did not change was the point I wanted to raise in this post. What the PBSG are finally trying to explain are the population estimates removed from status tables in 2005 and 2009 (the Laptev Sea estimate was dropped in 2013) – not mentioned in the text of the various reports at the time – that I called attention to last year. Now, the PBSG say they never gave a population estimate for East Greenland or the Arctic Basin. Oh, really? Have a look at the screencap from the 2001 report (Lunn et al. 2002). 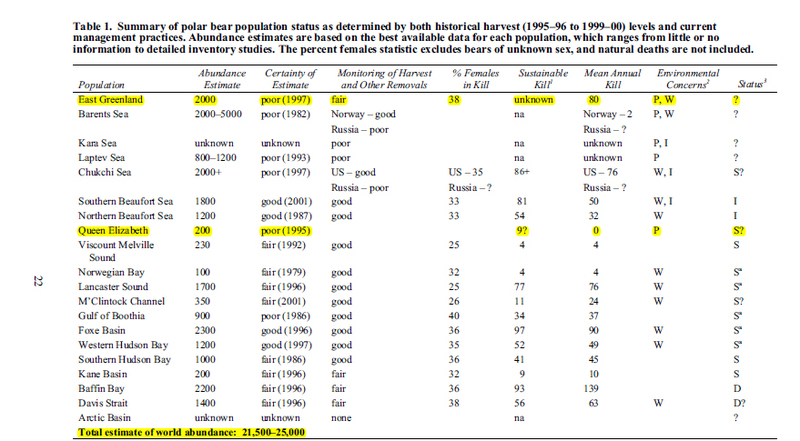 From page 22, here is Table 1, with a listing for East Greenland and its population abundance estimate of 2,000 bears, and Queen Elizabeth Islands (the old name for “Arctic Basin”), listed with an abundance of 200 bears. Figure 1. Polar bear status table from PBSG 2001 meeting (Lunn et al. 2002:22). 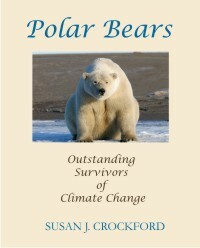 In 2001, the PBSG estimated that the number of bears in East Greenland amount was about 2,000 – now (in the July 8th version) they say it would be only a few hundred (~650), although they have now removed that information and replaced it with an estimate for all of the unsurveyed regions together. Figure 2. 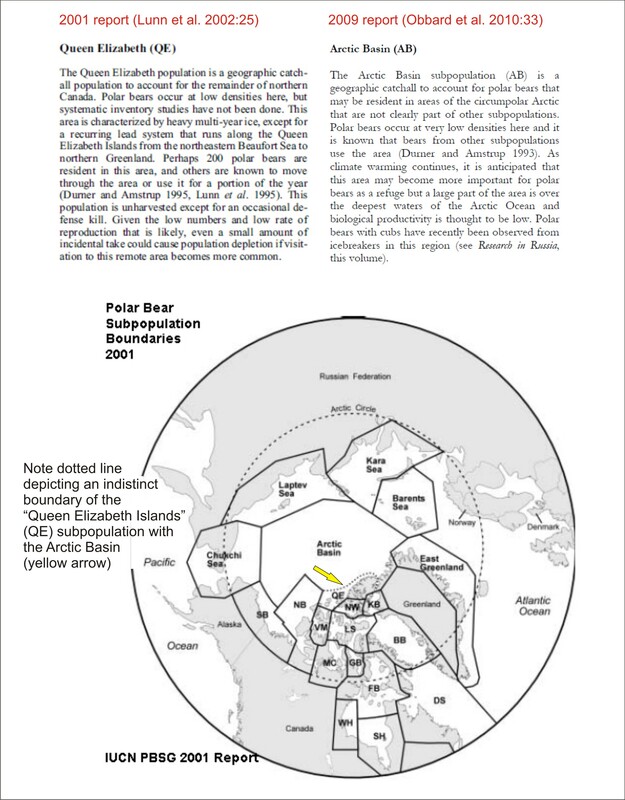 Map of polar bear subpopulation boundaries, from the 2001 PBSG meeting (Lunn et al. 2002) and descriptions of the “Queen Elizabeth Islands” and “Arctic Basin” subpopulations (from Lunn et al. 2002 and Obbard et al. 2010), showing how they are one and the same as far as the PBSG population estimates are concerned. Click to enlarge. It appears that, in the supposed process of doing a better job of communication and being transparent, Amstrup and Derocher chose to deny ever having provided educated guess-type population estimates for the Arctic Basin and East Greenland. Why even bother, when it is so easy to show they had? And I wonder, how does Kristin Laidre feel now about being part of a group that thinks this is “accurate and balanced” communication? Footnote 1: Differences between the two versions noted below (deletions in bold black, additions in red). It’s rather interesting that Amstrup and Derocher, who were given the job of drafting the document, could not resist the urge to editorialize about “threats” of global warming and declining sea ice – and that someone clearly objected (the “editorial” bit has been removed, paragraph 4 below). Lunn, N.J., Schliebe, S., and Born, E.W. (eds.). 2002. Polar Bears: Proceedings of the 13th working meeting of the IUCN/SSC Polar Bear Specialists Group, 23-28 June , 2001, Nuuk, Greenland. Gland, Switzerland and Cambridge UK, IUCN. http://pbsg.npolar.no/en/meetings/ Pdf here. 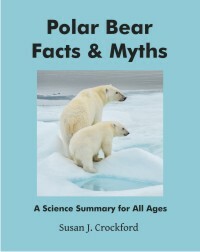 This entry was posted in Population and tagged Amstrup, Arctic basin, communication, Derocher, East Greenland, footnote clarification, global population estimate, Kristin Laidre, PBSG, polar bear population estimate, polar bears, status table. Bookmark the permalink.